Submitted by Migrate Wizard on 2014-07-04 21:34. Your stepfather was slain before your very eyes. Cast out into the world with nothing but the clothes on your back, you journey to the city of Edinburg to find a job, and to find your destiny. Tales of Arterra - The Lost is a story-driven single-player module that takes place on the world of Arterra. Version 1.08 makes minor updates to combat and brings the module to patch 1.65. The sequel is available here. Great gem and a must play especially for good alignments! I grant 10/10 for the series (10/10 for superb “Awakening” and 9/10 for the first "the Lost", which is a bit less engaging, but also very good). It is a very well written story (I like complex sentences like: “you can feel the dragon’s tension like a crushing weight upon you, squeezing the breath out of your lungs”), novel-like characters, moral dilemmas, grey ethics, well written dialogues and psychological depth of companions almost comparable to Dance with Rogues. Persey, a succubus that may turn good thanks to your support is one of the most enjoyable creations in NWN modules and I have played majority of what is worthwhile (consider this quote: “Countless men told me they would go to hell for me, but it is only you who actually did this”; in principle whenever you read “Persey looks at you curiously, with her bright grey-green eyes” there is an interesting talk ahead). Prepare for a memorable story about war of faiths, religious crisis, philosophy of life, salvation, weakening kingdom, battles (only some will be hard, but most will be enjoyable), redemption and complexities of good of evil. The second part of module 2 (Awakening) actually takes place in hells (they will try to sell you post-mortem your own equipment, haha! ), which brings about memories from Planescape: Torment, additionally enhanced by some music from PT. Some quotes, such as “there are infinite numbers of path in one’s lifetime; destiny is defined by those paths that are most common” (Seer) exhibit philosophical profoundness. In spite of only basic tilesets available back in 2005, Kevin Chan successfully created lots of interesting locations, characters and custom items (e.g. celestial Oni summon or shortsword granting hide-in-plain-sight feat). If it is not enough, an adequate selection of cool custom music coming among others from Icewind Dale and Planescape Torment, contribute to the immersion. Best classes to play this module: fighter/wizards (for magic items), fighter/bards (for summoning instruments), paladins, rogues with high UMD skill (for crucial class specific haste items, especially monk robes early in module2); a cleric may be a bit too easy. 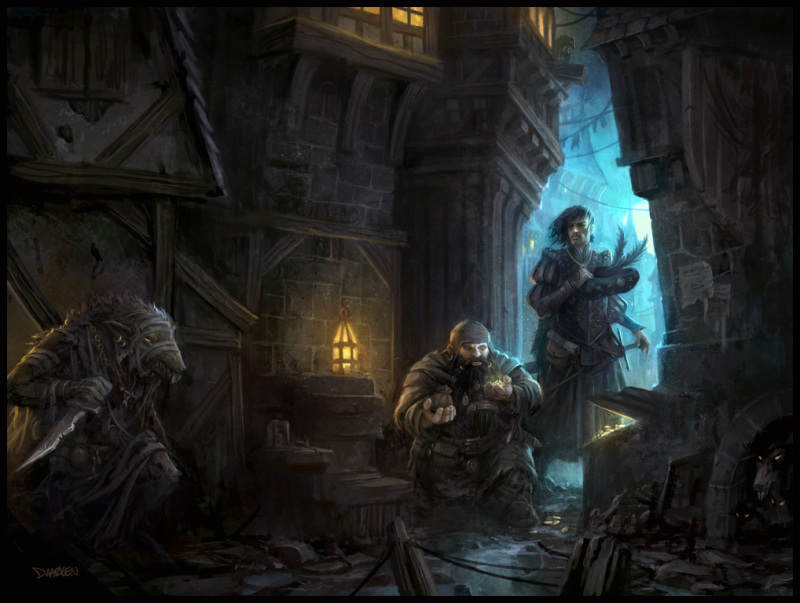 You will have 3 henchmen available: a fighter, a cleric and a rogue for almost the whole gameplay. The Lost does not have major bugs. PS. Additional thanks go to rogueknight, the author of Swordflight series whose post on Lilura blog convinced me to try Tales of Arterra. It is indeed a gem worthy of Hall of Fame in it's time, and perhaps until today. It has very good story which I liked, and the scripting is flawless. Wow! I just replayed this since the first time (top post from 3/2015) and I can't believe how much I enjoyed it again! I'd say maybe even more the 2nd time around, since there were so many things that I'd forgotten! I would love to add extra points (if we were allowed) for the excellent walkthrough which I referred to many times! As I said in my previous post, I'm eager to start Chapter 2 (again) and would highly recommend Chapter One to everybody! I might have stumbled onto a bug with Ezros (if anyone knows of a console command to help, please let me know). When I went into talk to him, we were in a battle immediately. I never had the conversation where he explains the source of the zombies. So I destroyed his phylactery and killed him, released the ghosts via their gems and headed back to town to make my report with the requisite journal in hand. But no new dialogue options are popping up so I can't seem to make a report. Did I miss something? I played this mod ages ago but never played the sequel. It's always been one of my favorites. Complex characters and a great storyline. Was able to trigger this bug again, though I'm still not sure how. Third try triggered the conversation. Incredibly tired of fighting that guy now, lol. List of all console commands included here. I meant one specific to this module since I think the problem is that I didn't trigger a conversation somehow. But I appreciate it nonetheless; handy to have for other games. It seems like a really cool mod. But I don't know why people were saying there weren't any bugs. I wasn't even able to continue on with the game because of the Hall of Elders. I ended up putting around 6+ hours into the game, and when I went into the Hall of Elders there was no way to go to the second floor to meet Lord Rayson (I believe his name is...). This was really disappointing for me, and I know installed the game correctly. However, I was using NWN:EE. Edit: I upped my score! I figured out that the problem was, indeed, an Enhanced Edition problem. Just finished this one and I really enjoyed it. This module has a rich story line with well developed characters. I will echo all of the comments by greg above. I will also add my kudos to the module holding up well despite its age. I played through with 1.69 and CEP 2.65 and I did not find any bugs. The battles were well balanced and quite challenging at times. I played with a human fighter using the henchmen as soon as they became available. This is a terrific module and I am looking forward to the next one. A very good module. Good dialogue and ok interesting plots. Sadly, NNW:EE 1.76 update (maybe 1.75, I'm not sure about that) has broken this mod. Edit: I think I've found and fixed all the affected Transistions. Assuming Kevin doesn't reply :(.. how do I go about posting my update here for others? This mod is too good/seminal to leave broken. When I try to drive a wooden stake it says "...failed to pierce his cold grey skin.." I cant kill vampires / drakkar, any solutions? My game is NWN:EE by the way.